Today's Gold Coast Bulletin, Friday 17th June, 2016. Going above and beyond to ensure the Coomera Town Centre keeps moving forward. 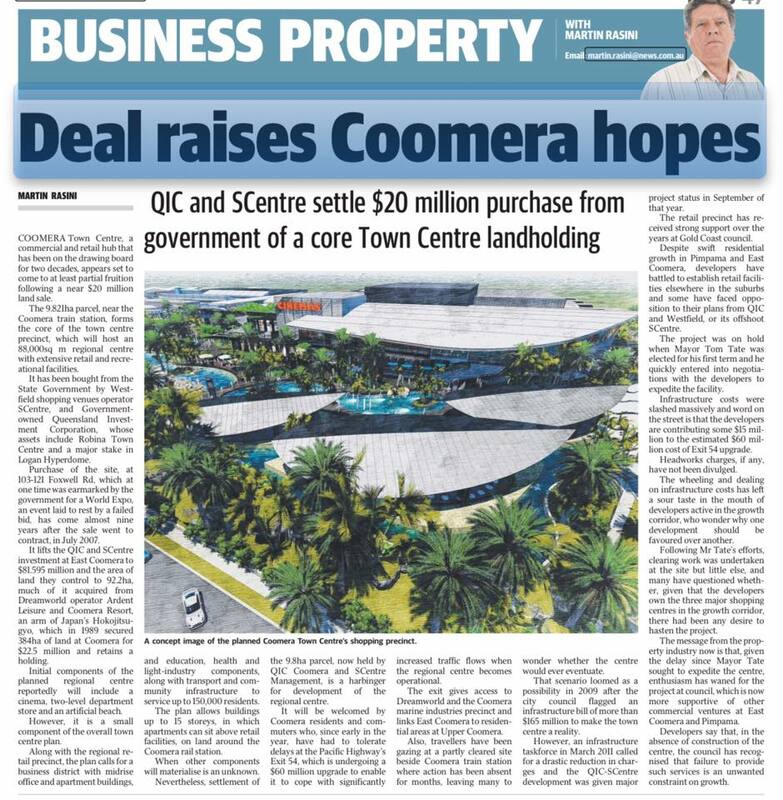 The Coomera town centre project is coming to fruition with another big step completed in Brisbane this week with the Westfield shopping centre building and management subsidiary, SCentre, finally completing the purchase of the core town centre site next to the train station. Back in 2012 I flew down to Sydney with the Chairman of Planning Cr Caldwell and my Cheif of staff Wayne Moran to meet with Westfield head honchos to get this stalled project moving. With the m1 exit upgrade underway Westfield has kept their promises to me in 2012 to get on with the project. Westfield said it was the first time ever in Australia that a Mayor had visited them (it has always been the other way around) and really gave them confidence to move forward with the project. The project will make a big difference in the north of our city that is staved of such shopping and entertainment facilities. I know our deputy mayor Cr Donna Gates will also be dancing a little jig as well this morning as she has worked hard with Cr Caldwell and my office on clearing hurdles that were holding back Westfield with this job generating project for the north.